If the buds on the ends of pine branches are undamaged, new growth will help camouflage dead needles until they fall off. Photo by Barb Gorges. Don’t touch those red needles just yet, cautions Lisa Olson, director of Cheyenne’s Urban Forestry Department. Wait until June to see if your pines and junipers get new growth before deciding what to do, she adds. 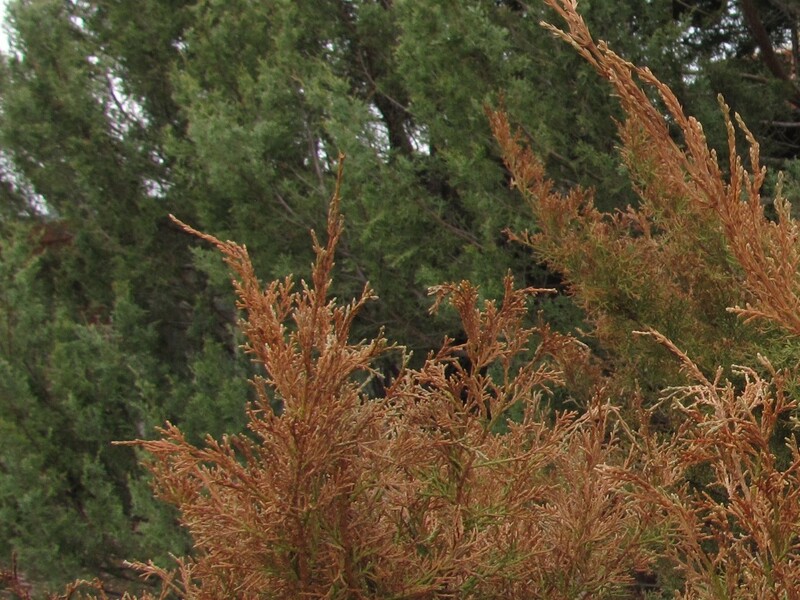 This past winter, property owners noticed that the needles on the tips of pine and juniper branches turned reddish brown. The color indicates the needles (juniper leaves are technically called scales), are dead. Cheyenne had warm weather later in the fall than usual, preventing some evergreens from getting the cues that they usually get from cooler temperatures to go into winter dormancy. When the temperatures suddenly dropped in November, the fresh growth froze and died. Most upright junipers (background) were not affected by the sudden freeze last November the way Pfitzer juniper shrubs (foreground) were. Photo by Barb Gorges. While pines and junipers were most likely to be damaged, exactly which ones were hit hardest seems to have been hit or miss. Upright junipers seem to have no damage while the spreading Pfitzer juniper shrubs were most often hit. But the amount of damage seems not to be so much a factor of how exposed the shrubs were to cold wind as perhaps variety. 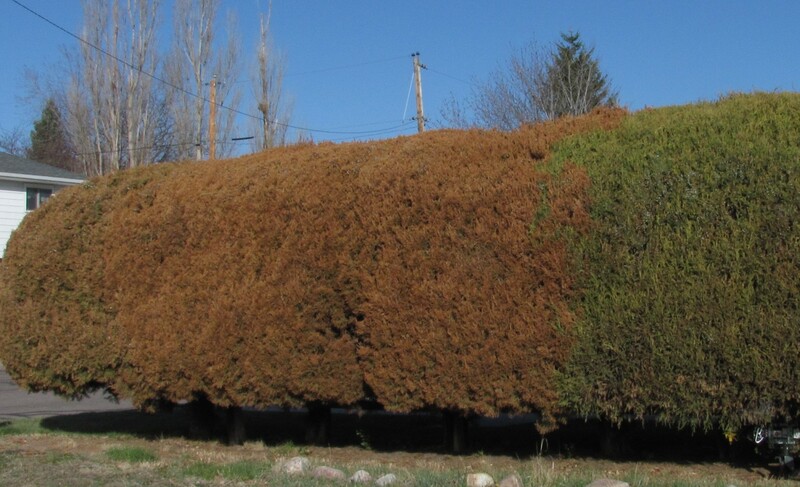 In one Cheyenne neighborhood there is a sheared hedge of Pfitzers made up of five individual shrubs. One is totally green, the next three are totally red, and the one on the other end is green with red tips. A property owner’s first urge is to cut off the dead stuff. However, this would add insult to injury for pines. The bud for new growth is at the tip of the branch. A bundle of new needles grows from it in what is referred to as “candling.” That’s because it makes the tree look like it has hundreds of pale green candles before the bundles open up. 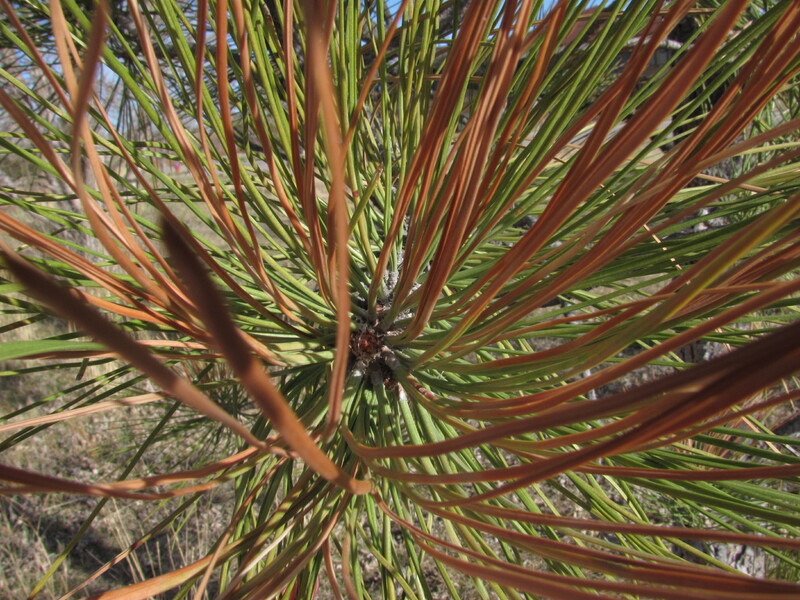 Pine trees keep their needles for three to five years before shedding them, Olson said. So if you are patient, the new needles will “overgrow” the dead ones, which will eventually fall off. There is no need to prune unless you have branches that need pruning for other reasons. If a pine does not candle all over, it may not have enough new green growth to photosynthesize, to make new buds next fall. A year from now is when those results will show up. Different varieties of sheared Pfitzer junipers, even in the same hedge, have had different reactions to the sudden drop in temperature back in November. Photo by Barb Gorges. Junipers grow differently than pines. Buds aren’t just at the tips of branches, and if their buds weren’t killed by the cold, they also might be able to “overgrow” the dead needles with new growth. The Pfitzers allowed to grow naturally have dead needles only on the tips of their branches—the newest growth from last year. Older needles are still green. So what happens to Pfitzers that have been sheared into tidy shapes? Many seem to be completely red. We’ll just have to wait and see if they survive. But Olson says this might be a good year to consider replacing overgrown Pfitzers. They are often used as foundation plantings but after a number of years they can grow 10 or 15 feet high and into odd shapes as their branches become deformed by the weight of heavy snow. If you have one of these, you might consider not waiting to remove it and plant something fresh. But otherwise, wait until June to see what grows before deciding what to prune. “It’s amazing how trees can come back,” Olson said. “It’s quite a feat for any outdoor plant to tolerate everything that’s thrown at it, and often they don’t survive if one day it’s warm and the next day unusually cold. If the transition extends over a few days, the plants become “hardened,” which means that the cells produce more sugar and that lowers the freezing point. “Over the years in Wyoming, our native and ornamental plants have been selected in one way or another to have pretty short hardening periods, but mortality will occur. The whole plant may not be killed, but if too many of the leaves and buds turn brown, the chances of survival are slim. The plant may look completely brown, but if the buds on the twigs or at the soil surface have not been frozen, there’s a good chance the plant will survive. Learning from experience, horticulturalists tell us which plants are most likely to survive in our state and which ones are not. “You mentioned the brown juniper leaves. Keep in mind that most evergreen plants, like the conifers and junipers, will still have some brown leaves, usually most noticeable in the winter and spring. The plants as a whole normally live much longer than individual leaves. “Evergreenness” is bestowed on some plants because they always have leaves that normally last at least one year before they fall off, and not all of the leaves fall off at the same time. Categories: Winter damaged evergreens | Tags: Cheyenne, evergreen winter die-back, Juniper, pine, pruning, trees, winter damage, Wyoming | Permalink.